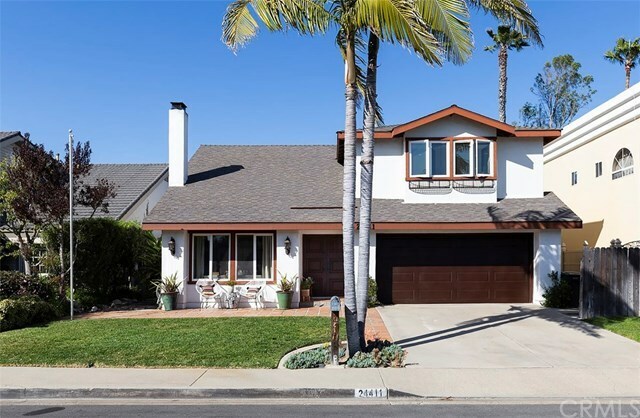 Entertainerâs dream with expansive, lush back yard with NO NEIGHBOR BEHIND YOU- This large, beautiful 2-story California Modern Spanish villa is located in one of Dana Point's most desirable communities, Sea Canyon, and features 4 bedrooms, 3 full baths and a bonus room. Walk through the double wooden front doors and vaulted, grand entry into the beautiful double living area with wood burning stucco fireplace. Stroll on coffee-stained concrete floors to the inviting open-concept dining area and remodeled farmhouse-inspired kitchen with butcher block counter tops and stainless steel appliances. Gaze out through gorgeous double French doors to the huge entertainerâs outdoor patio and dining area covered by a hacienda-styled high-ceiling wooden roof with lovely wrought iron chandelier. Walk out to the sitting area and relax under the shade of beautiful trees and warm up by the gas-fueled glass fire pit. Enjoy the view of your succulent rich planters and the beautiful Eucalyptus trees of Dana Crest Park just beyond your back gate leading directly to the park. There are only 5 homes in Sea Canyon that back up to the park and the homeâs close proximity to two parks makes it a gem! This home also features wood and Saltillo tile flooring, remodeled baths, a spacious master bedroom and bath with a large Jacuzzi tub, separate tiled shower with two shower heads and a walk-in closet. And with a dream back yard like this you may never want to leave.